How did Baker demonstrate his seriousness in negotiating with Syrian President Hafez al-Assad? Why was demonstrating seriousness so important in this situation? The success of the Gulf War coalition changed the political landscape of the Middle East. Baker wanted to seize the moment to pursue one of the most elusive goals in diplomacy — a peace agreement between Israel and its neighbors. Getting Arab and Israeli leaders to sit down together required negotiating with some of the toughest leaders the Middle East had seen in the 20th century: Yitzhak Shamir of Israel, Yasser Arafat of Palestine and Hafez al-Assad of Syria. The matter was complicated by the fact that all three men loathed each other. But Baker was determined. He made 15 different trips to the Middle East and met with failure time after time. 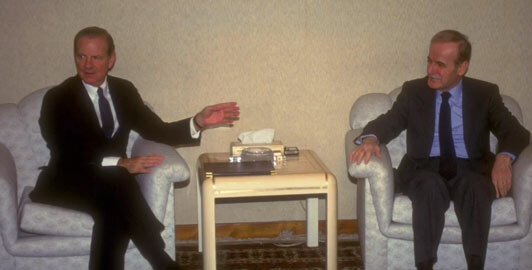 Haffez al-Assad of Syria was particularly difficult to work with. Finally, Baker began to make headway. Baker knew that the key to getting the Arabs and Israelis to sit down together was to get the different parties to sign on in an order that would promote success. Once the Palestinians, the Gulf States and Assad were on board, Israeli leader Shamir would be forced to say “yes” to a meeting. By October 1991 Baker’s back-and-forth diplomacy had achieved something many said was impossible. Israelis and Palestinians, along with virtually every other Arab state — and the Soviet Union — sat down together for a conference in Madrid, Spain. The Madrid Conference paved the way for secret talks in Oslo. Two years later the Israelis and Palestinians signed a landmark accord. Three years into his term of secretary of state, Baker was ready for more challenges. But in 1992, George H. W. Bush lost the presidential election to Democrat Bill Clinton. After 18 years in Washington, James Baker left public office and returned to Houston to practice law. Still, Washington beckoned. Every president since George H. W. Bush has called on Baker at one time or another to solve problems both domestic and international. And Baker, Washington’s “Miracle Man” negotiator, has answered the call time and time again. 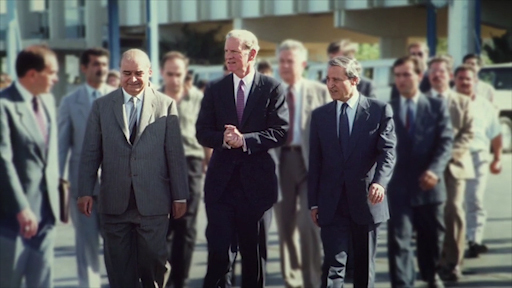 One of Baker’s toughest problems following the Gulf War was to convince Syrian President Hafez al-Assad to meet with Israelis. 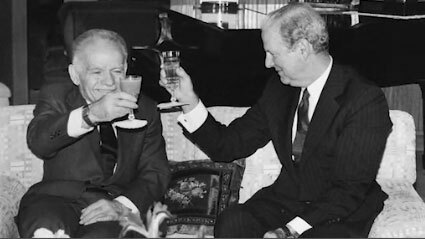 Baker’s close personal relationship with Prime Minister Yitzhak Shamir helped him get Shamir’s agreement to attend an international peace conference.